Bring the venerable Original Series bridge kit from AMT to a whole new level of realism. This photoetch/backlight film combination pack features spot-on graphic display screens (in the correct sizes and aspect ratios) for all of the small and large monitors. Each display incorporates a photoetched frame to help block light leaks when lighting* and is correctly in width and thickness. 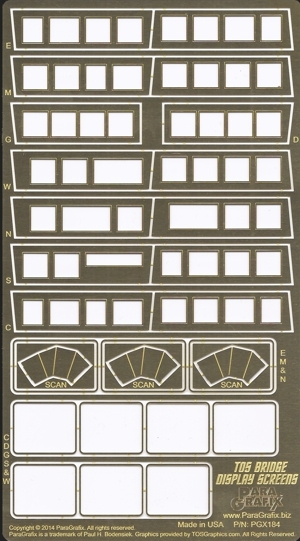 Templates are provided to help precisely position and cut out appropriate areas on the kits and include provisions for creating correctly indented master sections for the large upper displays. All graphics designed by Will "TOS Graphics" Smith and used with his kind permission. See TOSgraphics.com for more exciting information about the TOS Enterprise bridge and other Star Trek props. Please note that some of the modifications to the kit require precision and are intended for modelers familiar with scratch building and working to very small tolerances. BONUS! Three fold-up scanners for use at the Science and Engineering stations … along with the little noticed one on the environmental console.